Over the past several years, the preparedness planning community has been fortunate to draw the attention of numerous national and international standards organizations. This interest has resulted in the enhancement of existing standards, as well as development of a wide range of new high quality modern standards in such areas as disaster recovery, business continuity, emergency management, and risk management. Many organizations, large and small, public and private, are paying increased attention to the publication and proliferation of these standards because adoption could serve as a mechanism to facilitate improving their operational resilience. Such organizations, however, face a challenge: How many and which of the many relevant standards should they consider for adoption and institutionalization within their enterprises? An alternative approach to considering individual standards independently is to consider utilizing comprehensive and overarching frameworks that first determine the operational resilience needs of an organization, and then determine which of the many relevant standards might be applicable. 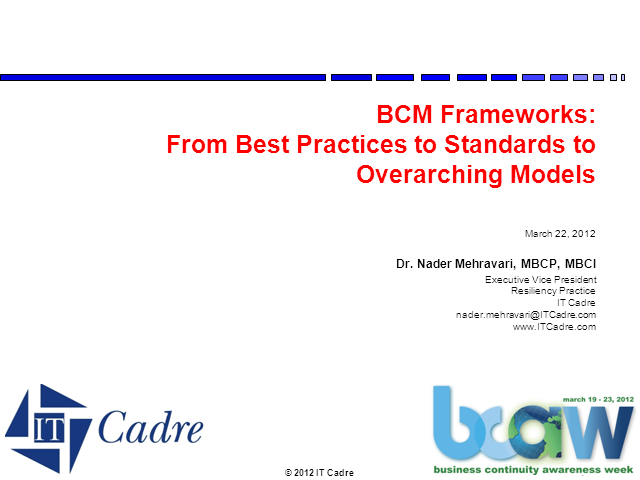 The goal of this presentation is to review the journey that the preparedness planning community has been on for the past decade, from use of best practices (e.g., BCI’s Good Practice Guidelines) to national and international standards (e.g., BS-25999 & ISO-22301) to overarching frameworks (e.g., CERT Resilience Management Model – RMM).